It amazes me how blind people become when a truth they refuse to accept is shown to them. Whether political, informational, or, in all actuality, any kind of category, it seems like they screw up their mouths, stick their fingers in their ears, and start screaming "LALALALA" over and over again, closing their minds to the situation entirely. They literally lap up crap from the rumor mill while completely ignoring supported and checked factual information. "In fact," he says, "for the most part people completely ignore contrary information." Incredibly, and sadly, it seems like people really are shoving their fingers in their ears. I read something like that, and I just get plain scared -- not just for the future of our country, but also because it seems like such a futile effort to even try to get someone to open up their minds and think about the gross untruths they not only believe, but eagerly propagate. I don't want to believe it's a hopeless cause, but I can't help feeling like it is. Don't misunderstand me; I'm not even in the slightest declaring myself on a "side" in a political sense. I am not telling you what you should believe, and I'm not telling you what your political affiliation should be. The only "side" I'm advocating is education and exposure to the truth -- not the belief in rumors and lies someone only wants to be true. Don't accept something as truth just because someone (a loved one, the media, a politician) says it is or because it "sounds" plausible. Research, improve and exercise your mind, and educate yourself on the issues surrounding our country, our communities, and ourselves. 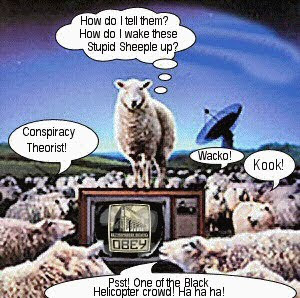 Just please don't let yourself become a sheeple.